As the weather chills, snow falls and socializing moves indoors, what could be more inviting than a warm cup of cocoa in front of a bright crackling fire? If your new home has a wood fireplace, here are some basics on fireplace care. Not just characters in Mary Poppins tales, chimney sweeps are professionals trained to protect your fireplace and your home from damage, debris and hazards. Certified chimney sweeps inspect your fireplace for damage to the brickwork and mortar, cracks in the tile flue liners, blockages such as bird, raccoon or squirrel nests, a build of leaves, soot, creosote and other potential causes of house fires and smoke damage. Hire a chimney sweep before you light the first fire. If your certified chimney sweep suggests repairs to your fireplace or chimney, do not ignore their advice. Have your chimney inspected at least once a year. Make sure smoke alarms are working correctly and have fresh batteries. You should have a smoke detector on every level of your home, inside each bedroom and outside the sleeping area. All alarms should be connected so that when one alarm is triggered, they all sound. Test your carbon monoxide detector. If you do not have one, get one installed. Install a chimney cap to keep birds and small debris out of the chimney and fireplace. Keep the damper closed when the fireplace is not in use. Not only does this keep debris from falling into your fireplace, it keeps the heat from escaping through the flue. Once you know your fireplace is safe to use, learn how to light a fire. While you may find several “sure-fire” ways to do the job, make sure to follow all safety procedures when doing so. Prime the flue. If your chimney is on the outside of the house, you’ll need to warm it up before lighting the fire to avoid smoke descending into the room. If your fireplace has a gas pipe, turn on and light the gas for a few minutes until the flue warms and you feel the air drafting into and up the chimney before you add wood to the fire. If you do not have a gas starter, here are instructions for safely priming your flue. Experts suggest building an “upside down” fire for a cleaner, longer lasting fire. To set up your upside down fire, stack larger fuel logs on the fire grate. Place smaller logs on top of these, and then place kindling and twigs on top of the stack. Lastly, top of your fire with balls of scrunched up newspaper or other tender. Light the fire from the top. As the paper burns, the smoke will exit the chimney while the paper lights the twigs and kindling. As the kindling forms coals, it will like the smaller logs and they in turn will light the larger logs. Allow an ash bed to form under the grate. 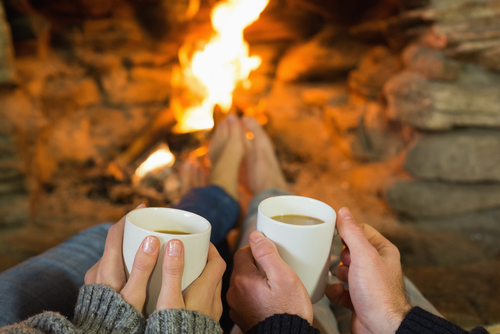 An inch or two of ash insulates your fireplace and keeps the fire burning hotter. However, don’t allow too much ash to build up, since that will dampen your fire and make it harder to light the next time. Enjoy your new fireplace, but stay safe as well. If you need recommendations for a professional chimney sweep, let us know. Each year, fire departments across the country respond to home and structure fires caused by holiday decorations. In a study by the National Fire Protection Association (NFPA) in 2011 showed an annual average of 230 structure fires that began with lights and decorations on Christmas trees and another 150 fires caused by holiday lights. Injury, fatalities and millions of dollars in property damage result from holiday fires. Live Christmas trees require consistent water levels to stay fresh. When purchasing a tree, be sure the needles are green and fresh. If the needles fall off easily, find a different tree … fresh needles are harder to pull out and indicate a freshly cut, healthy tree less likely to catch fire. Once the needles begin dropping, discard your tree. Your artificial tree should have a label indicating that it is fire resistant. Greenery should have fire-resistant labels as well. Look for labels from Underwriters Laboratories (UL), Intertek, or in Canada, the Canadian Standards Association. Keep your trees (live or artificial) at least three feet away from heat sources such as furnaces, baseboard heaters, fireplaces, candles or space heaters. 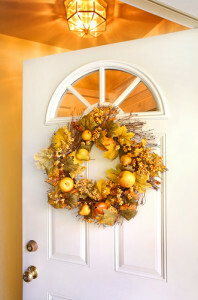 Avoid blocking exits (doors or windows) with your tree so that there is not impediment to escape in case of fire. Not only should your tree be fresh and green or fire-retardant, you lights should have safety labels. Avoid using lights that are old, have worn or frayed cords or other signs of excessive wear or damage. Rodents tend to like the plastic coating on stored holiday lights, so carefully check light strands for bite marks if your lights are stored in an area rodents can get to. Turn your tree’s lights off before leaving your home or going to bed. 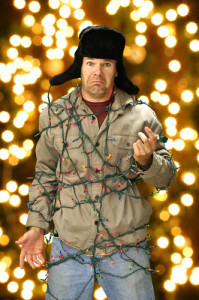 Do not connect more than three (3) strands of mini lights, or a maximum of 50 bulbs of screw-in type lights. Avoid attaching your lights with staples, nails or tacks. Instead, use insulated light holders. Remove icicles or dried leaves from gutters and the edges of your roofs, railings and window frames. Only plug outdoor lights into a GFCI (ground fault circuit interrupter) outlet. If you don’t have a GFCI outlet, purchase a portable one at your local hardware store that is rated for both indoor and outdoor use. Only use extension cords rated for outdoor use and make sure your cord is not damaged or worn. Do not hang your lights from gutters using staples or tacks. Instead, use specially made gutter and shingle clips that will not damage your gutters or lift your shingles. Each bulb or icicle cord drop should have its own clip, so be sure to purchase as many clips as you need for safety. Use LED lights. These will save you energy, and because the burn cooler, are less likely to cause fires. Avoid using 7-watt bulbs. Although they are more brilliant, they can get dangerously hot and cause fires. Use 5-watt bulbs instead. Stay away from power lines. In older homes, power lines may come into the home from the roof. Keep yourself and your decorations at least 10 feet away from power lines. Above all, stay safe during the holidays. If you do not have the equipment, health and tools required to safely decorate your home, hire a professional. 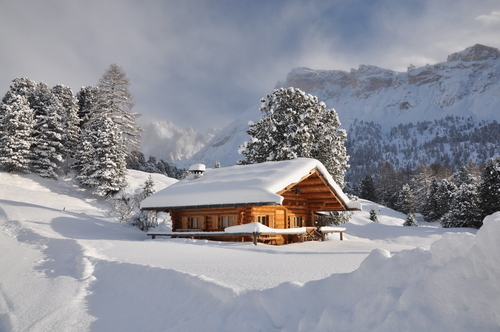 Whether it is your summer vacation cottage, or your recently vacated home put up for sale, proper winterizing prevents your home from deteriorating while it’s empty and saves you money both now and later. Decide what needs to be done and make a list to check off as you do it. Be sure to add these areas to your list. Plumbing: Turn off water at the exterior of your home. Make sure the lines completely drain by turning on all the taps until no more water comes out. Water remaining in the lines can freeze, causing your pipes to burst and resulting in very expensive repairs both to the pipes and to floor coverings and walls. Blow water from pipes using an air compressor. Pour RV-type anti-freeze in the traps. Close sink and tub drains to keep out critters and preventing odors. Cover the toilet bowl with plastic wrap to prevent sewer gasses from entering your home. Appliances: Drain water from your dishwasher, washing machine and your refrigerator’s water lines. Remove your refrigerator’s water filter so that it does not freeze and break inside the refrigerator. Drain and turn off your water heater. If your power will be off, completely empty and clean your refrigerator, then prop the door open to prevent mold growth. Utilities: If your home has power during the winter, set your thermostat low, but warm enough to prevent freezing and to keep your home dry so that mold does not grow. Also, unplug all appliances, including televisions and microwaves to prevent risk of fire from faulty wires. Pests: Remember that mice and rats like warm places. They also like to gnaw on wires. If your home is prone to pests when it is empty, set out bait or traps, or consult a pest control professional. Remove any foods stored in boxes or bags, since pests can chew through the cardboard or plastic to get at the stale crackers or cereal inside. Remove any liquids that might freeze. This includes bottled water, soda or beer in cans or bottles, and even paint. Close flues and dampers, windows and vents. Seal any opening that might invite pests or the cold into your home. Closing shutters or drapes will keep the sun from fading your carpet and protect your windows from inclement weather such as hail. Wash linens and store them in plastic bags. The vacuum-sealed storage bags repel water, dirt and insects and protect your sheets, towels and blankets from mildew and mold. When your vacant home is for sale, it is smart to leave the power on. If the home uses gas for heating, then be sure to leave the gas on as well. Buyers want to see the home, so if it is too cold or too dark, your home is less likely to sell. Check with us about managing your empty property. You’ve invited everyone to celebrate Thanksgiving with you in your new home … a joy-filled day with family and friends, good company, great food, celebrating old traditions and creating new ones! The first holiday gathering in your new home celebrates more than the season, it celebrates the start of special memories in a new place. Most likely, you’ve spent your decorating budget on long-term furnishings for your new place. To add a little holiday panache, create a centerpiece of beeswax candles, gourds, mini pumpkins and dried leaves. Or place some bare branches in a vase. Have everyone write something they’re thankful for on a paper leaf and tie it to the tree. As you gather for the meal, let everyone choose a leaf to read. A floral basket with late blooms from you new backyard blend nicely with branches of dried berries and white pumpkins. For more simple and beautiful centerpiece ideas, check out these great options or search on “thanksgiving decorations” on Pinterest to see what others are doing. Realize, too, that your new home may be décor enough since many friends and family will be seeing it for the first time. 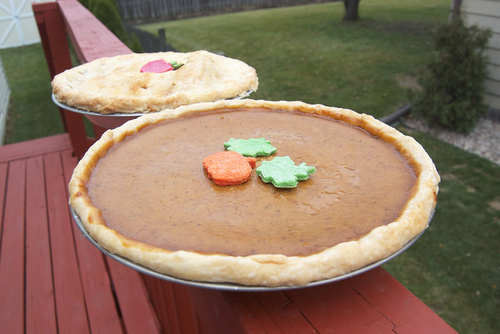 Whether your plans include an elaborate spread or simpler fare, everyone loves to get involved. So, let Great Aunt Lydia bring her famous fruit salad, and let the kids make the green bean casserole. Part of the fun is in the doing and the best memories include both the old traditions and the new. Speaking of new … try a simple new recipe like Sweet and White Mashed Potato Swirl, or an easy make-ahead fresh cranberry Jello salad or a cranberry mimosa. Simplify the day by making some of your meal in a slow-cooker. If you’re adventuresome, try a Cajun-style deep-fried turkey. If your new home is smaller, consider serving buffet-style. If you live in a warmer clime, perhaps adding a portable outdoor heater can extend your dining area to the patio. Enjoy the time with family and friends. Don’t make your menu so complex that all your attention is on the meal preparations instead of your guests. If there are ways to minimize the mess — foil pans, paper plates, etc. — and simplify the cleanup, so much the better. You don’t want to miss out on family tag football in your new backyard because you had dishes to do and pots to scrub. Need a new home for the next holiday? If you’re not yet in your new home, we can help you find one for the next holiday. Give us a call … we might even help you find a Black Friday special over the holiday weekend and get you well on your way to celebrating next Thanksgiving in your new place. This time of year, leaves turn beautiful shades of red, vermillion, orange and yellow. We enjoy their beauty. We take photographs. We collect them. Our children play in them. For a homeowner, however, leaves pose the possibility of damage to their landscaping, their home and their relationships. 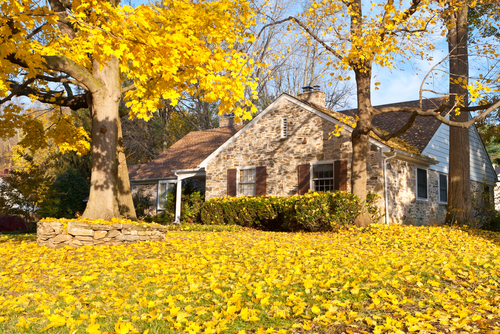 Most municipalities consider leaves to be a natural product, so while a homeowner might be responsible for damage to a neighbor’s home from a falling branch, that is not the case with falling leaves. So, when the leaves from your yard blow into your neighbor’s yard, he may not have a legal claim, but it will strain your neighborly relationships. Make sure to talk to your new neighbors about the leaf situation. If she finds them a nuisance, you might offer to rake her yard as well. The best neighbors come up with a solution together. To help you through your retirement, you took out a reverse mortgage on your family home. Now, several years into your retirement, you son wants to buy his childhood home so you can move to a warmer climate. Can you sell your home? A so-called “reverse mortgage” is a home loan that offers regular cash payments (in a single lump sum, a monthly advance, a line of credit, or a combination of the three) to a homeowner based on the home’s equity. The borrower must be above the age of 62 (in the U.S.) and the home must be his/her principle residence. Economists proposed the loans as a means of assisting seniors in maintaining a level income, and the IRS does not consider funds from a reverse mortgage to be income, but rather, loan advances. Typically, the borrower can defer repayment of the loan until he dies, sells the home or moves away from the home for more than 12 consecutive months. When the loan comes due, the borrower or her heirs may refinance the loan, pay the loan with interest or sell the home, cashing out any remaining equity. Alternatively, they may turn the home over to the lender of the reverse mortgage, giving up all claims to the property or the equity in the property. With a HECM (Home Equity Conversion Mortgage), available through the Federal Housing Authority (FHA), the borrower can never owe more than the home is worth, so the lender only has recourse on the property, not the borrower or the borrower’s heirs. Determine how much is owed. You will owe all of the money borrowed to-date, compounded interest on that money, and fees that the lender may charge. Obtain a payoff quote from the lender. This gives you an estimate of the amount required to pay the loan in full. Remember that a payoff quote is for a specific date or date range, so if the sale takes longer than anticipated, the final amount likely will be higher than the quote. Contact your real estate agent. We not only can help you with the sale of your home, we can help determine the fair market value and determine if selling a home with a reverse mortgage is appropriate for your situation. When the home sells, the reverse mortgage will be paid from the proceeds of the sale. Any remaining monies after paying off your real estate agent and any liens, fees or other loans will be yours. Remember that the original reverse mortgage loan may be higher than what the property currently is worth. In that case, it may not be in your best interest to sell the home. We can help you determine if selling your home is the right decision for your circumstances.